I can’t help but be a little disappointed with most cookbooks. Full of glossy photos and potentially delicious meals, I know that in reality, I won’t be making the majority of their recipes. First, it’s because most of the time, I have a few things I make over and over, and I stick to them. Next, many cookbooks aren’t quite as well-written as their beautiful photos would have you believe. When you come across recipe instructions that require using four different pans and three appliances to make a casserole, you know you’re in trouble. I’ll admit to being a harsh critic, but a poorly written cookbook recipe is pretty inexcusable. Finally, I just don’t make elaborate food at home. Yes, I trained as a chef and have made recipes whose preparations could take as long as several days. But now, when I want something fancy, I go to a restaurant and pay someone more skilled to make it for me. And it works out just fine. Interestingly, when you read about what the world’s great chefs make for themselves at home, it’s never fancy. It often involves a quick sauté with some fresh vegetables and beloved salt and pepper. These are my people. But I can’t help but get caught up in the excitement of promising new cookbooks, in hopes that some will conform to my more modest aspirations of simple, straightforward cooking at home. Recently, I tried a few recipes from three newer vegan cookbooks that did just that. The first was The Make Ahead Vegan Cookbook by Ginny Kay McMeans. I’m a devotee of make-ahead and freezer-friendly meals from my years working in an office. I would prep breakfast, lunch and sometimes even dinner to bring with me to work. With over 125 freezer-friendly recipes, I loved that this book allows you to put away delicious food for later. Not only did The Make Ahead Vegan Cookbook offer make-ahead recipes, but they were easy, too. I was particularly taken with the hearty Italian Cannellini Soup. (I made it easier on myself by using canned beans instead of cooking them, but didn’t feel I compromised the recipe). I froze it in individual serving containers making it an easy grab-and-go lunch. I also loved the Black Bean Salsa Tacos which were full of flavor while using only a few ingredients. I could have frozen the beans, but they were eaten within a day. All of the recipes are comforting and the ingredients familiar. No searching for obscure or expensive one-time use items. (Always appreciated). The Make Ahead Vegan Cookbook also includes great tips for what can (and can’t) be frozen. Another recent cookbook find was Cook the Pantry by Robin Robertson. I’m a long-time fan of Robin Robertson and bought her epic 1,000 Vegan Recipes back when it first came out. I was attracted by the title, Cook the Pantry, which promises recipes in 20 minutes or less. The idea of Cook the Pantry is that you can easily prepare quick meals by combining fresh foods with convenient pantry ingredients. Because let’s face it, we don’t always want to cook everything from scratch. I loved the Red Beans and Quinoa with Chipotle Queso. The cashew-based chipotle queso loaded with spices, canned green chiles and, of course, chipotles is remarkably good. I also enjoyed the White Bean Niçoise Salad which includes canned cannellini beans, Kalamata olives and a splendid vinaigrette. Another recent and long-awaited find was Minimalist Baker’s Everyday Cooking by Dana Shultz. I love that this book is mostly gluten-free as I’ve been more sensitive to gluten lately. Also welcome are the categories for “1 bowl or pot,” “10 ingredients or less” and “30 minutes or less” recipes. 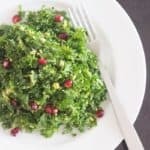 My current favorites from Minimalist Baker’s Everyday Cooking are the Greek Kale Salad which has a delicious lemony garlic-herb dressing. 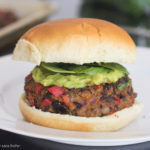 I also enjoyed the combo of unsweetened chocolate and black beans in the Hearty Cocoa Black Bean Burgers. Cooked quinoa provides the burgers with wonderful texture while making them more substantial. Great for freezing, too. Let me know in the comments if you’ve enjoyed any easy recipes from these cookbooks. I’d love to try them, too! 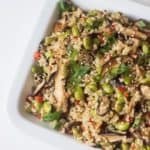 Looking for quick and easy plant-based recipes? 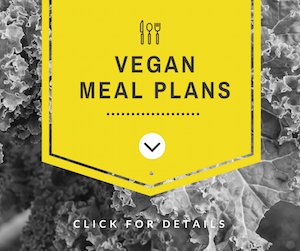 Try my simple vegan meal plans now! « The Weekend Vegan Challenge starts soon!